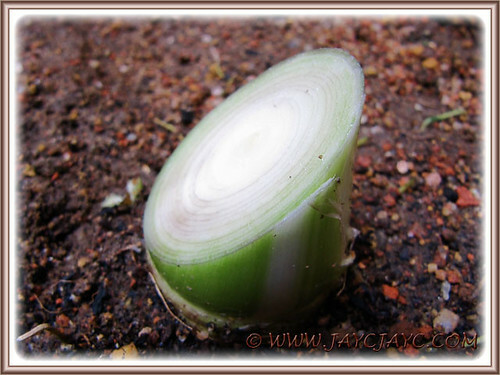 How to revive an ailing Variegated Crinum Lily? We were overwhelmed with joy when an eye-catching Variegated Crinum Lily joined our garden party at the beginning of July 2013. However, it didn’t cross our mind at all that our joy at seeing its beautiful presence at our courtyard would be short-lived! Just three months down the road and it had lost its lushness. What a sorry state the plant was in, when we scrutinized it about 10 days ago! One moment our Variegated Grand Crinum Lily (Crinum asiaticum ‘Variegatum’) looked so healthy and sparkling, the very next moment, so to speak, fully riddled with unsightly patches. So heartbreaking to see the extent of foliage damage by the invading pest and its troop. Many times we have failed to look at the underside of leaves for signs of pest disease until it’s too late. Believe me, these garden pests can devour a plant within a short span of time! We’ve not been vigilant, putting our guard down too often due to carelessness or simply pure laziness or adopting a take-it-easy attitude. Even though our ailing Crinum Lily looked beyond repair, we have no intention of trashing it but desired very much to save it if possible. What should we do to revive this treasured beauty? A helpful member at Facebook’s ‘My Nice Garden Chat Group’ had agreed that all diseased leaves be removed to enable the plant to grow again from its healthy bulb. Another suggested that the culprit was likely to be the red spider mites – and, so it was as I googled further to educate myself on this garden pest. So glad that I landed on Bonsai Garden and read its enriching article that included detailed description of the pest and tips on how to control the red spider mites. Armed with new insights, we proceeded to take the necessary actions with confidence. All the affected leaves were snipped off with a sharp knife. It was indeed a truly painful task for us both as we love the plant dearly! Hesitantly and with much reluctance, we removed all the leaves except the apical leaf, with the assumption that it was the growing tip. But upon checking, we found that it was also infected with the red spider mites. Hence, that top leaf has to go too. Is it alright to cut the pseudostem, we asked ourselves? Googling for answers led us to many sites that mentioned about cutting the pseudostem of bananas and how they grew back successfully and impressively. We were not sure whether this can be done on a Crinum Lily. Further results landed me at ResearchGate that stated that ‘this phenomenon is common with most of the monocots‘. With that clue, I found out that Crinum Lily is a monocot. Hence, I deduced that it’s viable to do the surgery! With confidence, my darling John proceeded to cut the pseudostem of our Crinum Lily with a sharp kitchen knife. The cut was slanted so that water would flow easily to prevent rot. Then, we just sat back and waited hopefully that all will be well. Thinking back, I had tried this method on our diseased Alocasia sanderiana (Kris Plant), a monocot too, and managed to revive it. Somehow we felt assured that our Crinum Lily will survive too. In less than a week, the cut made on the pseudostem had resulted in thrusting forth a tiny bulge from the central growing point. That’s a promising sign of growth, an apical leaf will emerge sometime soon, we’re pretty sure of that! Yippee!! Our Variegated Crinum Lily has been revived and we’re overjoyed again! Besides, we’re mighty glad to have acquired so much knowledge along the way… a steep learning curve for us. Learning is such fun and gardening provides boundless schooling opportunities! It really took its time to put forth healthy leaves. Many a time we had to remove emerging young leaves that showed patches of pest infestation. Probably, it didn’t like being at the courtyard which received only the passing sunlight. So we relocated it to our front yard where it could enjoy sufficient sunlight. Just to show how beautifully it has grown with our tender-loving-care. It’s thriving marvellously and had produced several pups to make us so happy! 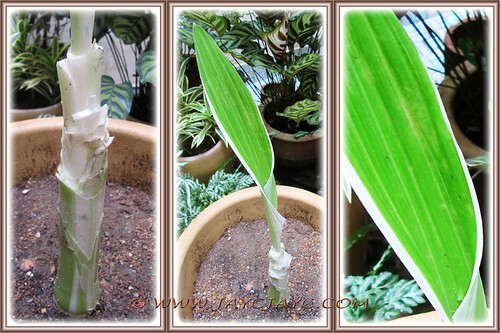 Yay… our Alocasia sanderiana (Kris Plant) has resurrected! That is a resilient plant Jacq. No need to worry about it as it will jump back to life. But you need to watch out for those spidermites as they do come back again. The reason is that the smaller ones are invisible to the naked eye and when the infection takes place and that its too late – thats when they are soo visible. They are still there – those red mites on your side of the pots. They can indeed survive months without any food. My suggestion is simple and effective. When you are very free and have an ample of time. 1) Get a newspaper roll it up properly and burn (use a lighter or a candle) at the side of the newspaper and run the fire around the flowerpot. Around the rim and a quick swipe on the soil. This will kill the remaining invisible nymphs and eggs. 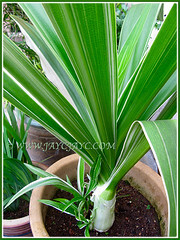 I had used it for orchids but a plant such as big as this – its just too much to handle. 3) Do check other plants. They might had infected or might have sourced from another plant. Your plant is sitting close to Marantha & those peacock plants too. Check carefully if they are sitting at the back of the leaves. Ooh James… thank you so much for additional information and tips. We truly appreciate you taking the trouble to highlight the possible ‘scary’ scenario of its continuing presence. Indeed you’re spot on – I think these mites have been residing in our courtyard for a few years and had been the major cause for the demise of some of our foliage plants there. 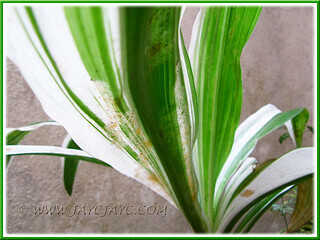 In fact, I’ve just balded all the leaves of our Cardwell Lily plants a couple of days ago as they displayed the same symptoms of red spider mite infestation (if I recall correctly, this is the 3rd or 4th time the Cardwell Lily got a full shave and probably is the main host plant for the dreadful pest). Hmm… the best thing is to trash the whole pot, including soil and stumps. Will do this soonest, when we return from our weekend holiday in Cameron Highlands. I would really encourage that you don’t throw away your pot. Infact you can scrub & wash it with soap and it good enough that way. But my point is that spider mite can stay dormant and hide somewhere apart from the plants. They seemed to come to these type of plants and so the best measure is kill them as they continue to come back – using the host plant as the bait. When you ditch the infected plants – they will go super and infect other plants. So the best thing to get them controlled. Thanks again, James, for your sharing and advice. 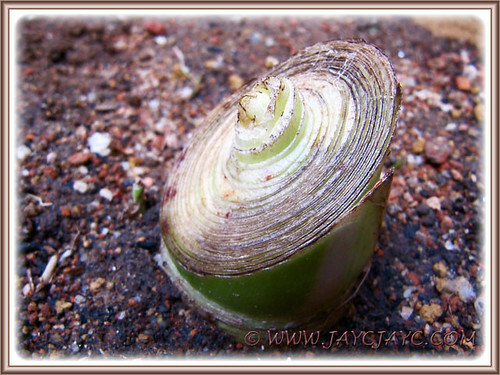 My darling John had already discarded the infested soil and stumps, but refused to waste a pot. So he had it scrubbed and sunned… hope we see the end of these awful pests. Have a lovely day and God bless. I found your site when looking for foliage plants. Nicely maintained. Keep up the good work. 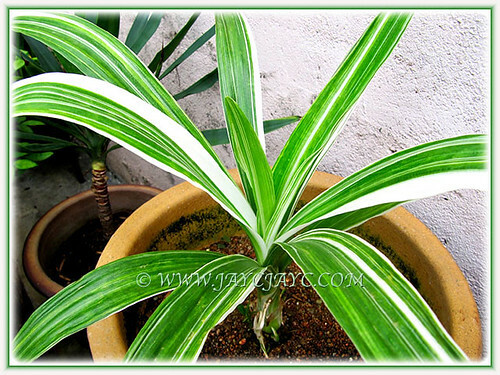 The plant shown here looks more like a variagated chlorophytum rather than a lily. Crinum lilies are big. This plant looks small. However, the cut stem, with all the rings must be quite thick. That was just an observation. Correct me. Thanks for your thumbs up and encouragement, Uday! 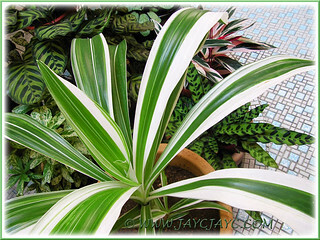 Our plant above is indeed a Variegated Crinum Lily. 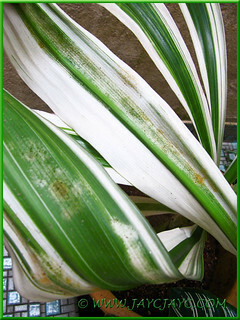 Though the foliar variegation may be somewhat similar to that of a Variegated Chlorophytum, they’re entirely different plants. 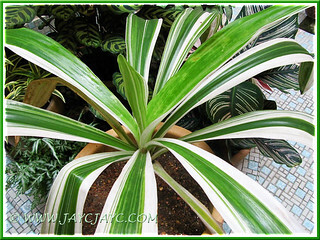 Unlike Chlorophytum, the Crinum Lily will develop a thick pseudostem as it ages, has very much larger leaves and develops suckers to self-propagate new plants.